Considering the tidal wave of fear-driven headlines these days, it’s tough focusing on the biggest issue we should be worrying about. Climate change causing the oceans to rise? Over-exuberant stock market heading for a crash? The New England Patriots winning another Super Bowl? The problem is that human brains just aren’t wired to make accurate risk predictions. Financial advisors know this, which is why they rely on tools to help them evaluate their clients’ tolerance for investment risk. Combine that with the DOL fiduciary standard and you can begin to explain the sheer number of risk-assessment models available to advisors. However, new legislature has not yet helped us define terms such as “know your client” or how to best accomplish it. In theory, advisors are required to understand the goals and financial circumstances of the client, so that they can create solutions with an appropriate level of risk. That may sound straight-forward, but human behavior and the response to risk is complex. 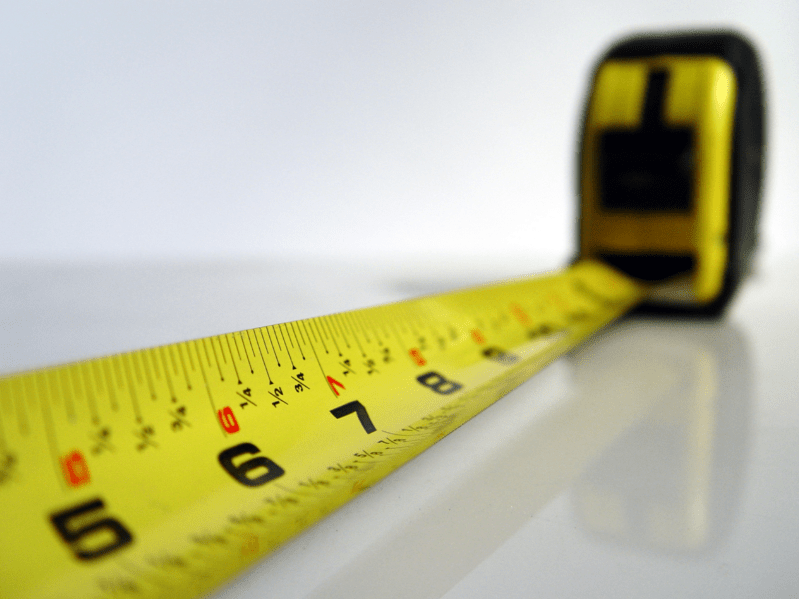 What exactly should you measure to get the correct answer? Risk tolerance questionnaires was meant to help with that quandary. Its primary purpose is two-fold: to take the risk temperature so that the advisor can create a portfolio with volatility that matches the client’s comfort level and to give the advisor armor in the event of a lawsuit. After all, concrete and measurable risk numbers should be the best evidence that you have made every effort to offer prudent advice. Right? Is Personality Testing the Answer? If directly measuring anticipated response to financial risk does not work, what can advisors do to get a snapshot of the client while still standardizing and proofing the process enough to hold up in court? One company thinks that psychological profiling is the way. DNA behavior International, an Atlanta-based firm founded by Hugh Massie, has developed a very different take on the traditional risk tolerance questionnaire. How do they do it? The Financial DNA assessment is a series of 42 questions – an unusually high number when compared with other products. But you won’t find any of the same-old financial risk questions on the list. Leon Morales, the CRO of the company, explained that the traditional questionnaire format allows users to fake results by choosing what they believe to be the “right” answers, whether consciously or unconsciously. 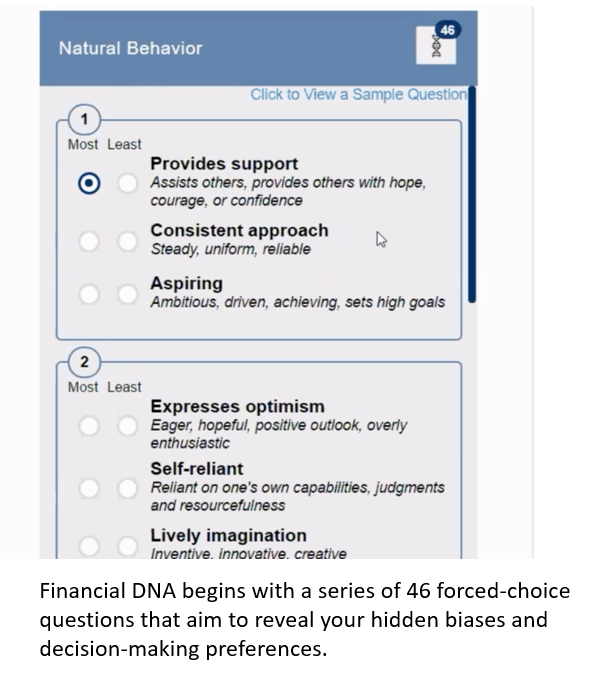 Financial DNA uses a set of forced-choice questions that focus on communication style, behavioral biases and goal setting. The resulting risk profile is based on the snapshot of the client’s core biases and decision-making preferences and is more accurate, Morales claimed. The goal of the product is to help advisors become wealth “mentors,” according to Massie. Their psychometric-based system leverages comprehensive behavioral insights to more accurately measure each client’s risk appetite. Their clients report increases in their rate of asset gathering when using their product versus standard risk tolerance questionnaires, Massie reported. If that sounds really different from the common risk tolerance questionnaire approach, you are right. Things get even more interesting when it comes to the execution of the idea. Existing risk tolerance questionnaires are not without their caveats. Most solutions on the market generate their assessments through a series of financial simulation questions and what-if scenarios. What percentage in a portfolio value decline would a client consider acceptable? Would he prefer a certain gain of 8%, or a 50/50 chance of either losing 30% or gaining 100%? There are 3 potential problems with this approach. The first one is the overly technical nature of the questions. For a client that’s not financially savvy, the choice between a certain gain of 8% and a chance to lose or gain a larger percentage of the portfolio value can be confusing. Some tools work around this by quoting specific dollar amounts instead of percentages. That approach makes the question more tangible but no less theoretical. One of those tools is from Auburn, CA-based Riskalyze. Their chief investment officer, Michael McDaniel, believes “that their risk number assessment that advisors use to understand how much risk a client can handle or tolerate effectively captures all the impacts of an investor’s psychometrics and personality”. The second problem is response bias. Wikipedia defines this as a wide range of cognitive biases that influence the responses of participants away from an accurate or truthful response. They are most prevalent in studies that require participants to self-report their responses. In other words, a self-reported response to a future event is often quite different from the actual response in a real life situation. Sure, a client might tell you he would accept a possible 33% decline in his portfolio value when he is sitting in your office. But that response is not probably not the same one you would get if the market were actually crashing to Earth. A 2012 study of risk tolerance questionnaires showed that many products failed to accurately predict client behavior when they are under pressure. Not surprisingly, loss aversion and self-assessment questions fared better than questions based on economic theory. Other applications take a similar approach. FinaMetrica also uses a psychometric-based questionnaire, but has 25 questions, which could more suitable for use by financial planners providing a comprehensive multi-goal planning service, co-founder Paul Resnik stated. Late last year, FinaMetrica announced an abbreviated 12-question version that was targeted at enterprise clients such banks and insurance companies that need to generate risk tolerance quicker and scale the process across a larger client base. The third problem is the complex nature of what we are attempting to measure. Risk tolerance is the client’s willingness to take on risk. Capacity for risk refers to the client’s financial ability to absorb the consequences of taking a risk. For example, a client could have a high stated willingness to choose a volatile portfolio in exchange for higher potential gains. If that same client is so close to retirement that his financial ability to weather a dramatic drop in portfolio value is low, low capacity for risk might render high risk tolerance irrelevant. Then there is risk perception: how risky the client thinks the markets (or specific investment choices) are. If perceptions are not grounded in reality, clients can make decisions that are at odds with their risk tolerance and capacity for risk. Most tools lump those three sub-categories of risk into a single number. That approach can be misleading. The relative importance of each component is different for every client and the one-number answer does not accurately reflect those dynamics. Clients and prospects can take the Financial DNA assessment from a personalized link shared by an advisor in an email. Advisors also have the option of embedding the link on their website. The assessment can be done on any device and takes 10-12 minutes to complete. Assessment results identify an individual’s preferred communication style and offer insights into automatic decision-making processes. The tool also places the individual into one of seven risk groups (1 being most risk-averse and 7 being most comfortable with risk). Once a new assessment is completed, the advisor receives an alert via a sleek dashboard. Results can be used to guide the next conversation with the prospect or client. Our favorite part of the dashboard is its ability to combine assessment results with real-time market data. Dubbed Market Mood, this feature places every client on a scale from exuberant to apprehensive depending on his or her personal biases in the context of current market performance. For example, when the market is up strongly, there may be some clients that become anxious about an impending decline. Financial DNA provides recommendations on how best to placate each client based on their psychometric results. 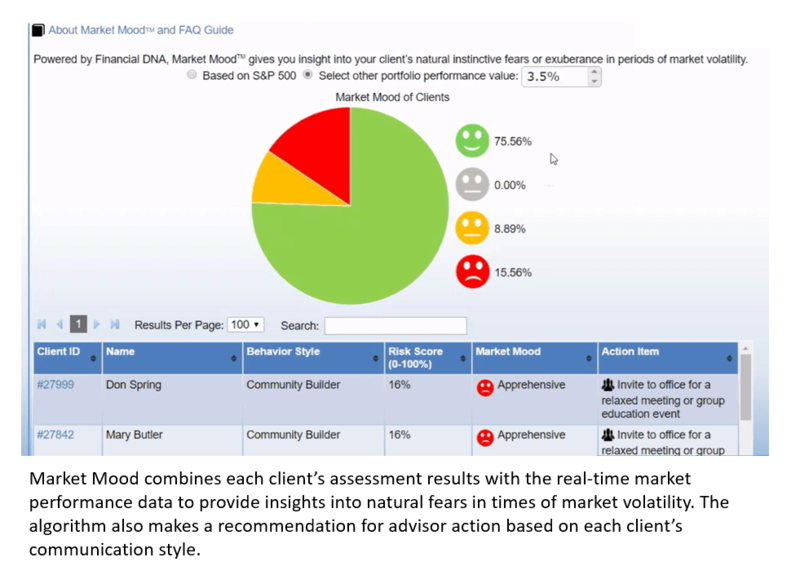 Sleek graphics give the advisor a pulse of the overall client base while the drill-down reports offer specific action suggestions based on every client’s preferred communication style. For example, based on Jane’s portfolio risk group, current market performance and preferred communication style, the system may recommend the advisor sends a market analysis summary, an informal text message or an invitation to an in-person meeting. Advisors report that Market Mood offers a structured approach to engaging clients at the right time. We would love to see this functionality integrated with a CRM. The CRM integration is not currently available but deep API build-out is on the future roadmap for the product. The platform has a few other interesting applications. The system-generated risk group assessment for the client is automatically compared with his or her portfolio risk as well as the advisor’s personal risk group. A scenario in which client Mary has a risk group score of 2, her advisor has a score of 7, and Mary’s portfolio falls into group 6 would be flagged as a potential compliance risk. Within larger firms, assessment results could be used to pair incoming prospects with advisors. Just swipe right for a perfect match! Another application, shared by family offices that use the product, is in combining assessment results for multiple family members to better predict and manage interpersonal dynamics in decision-making. Certified Wealth Mentoring Package – $370/month/advisor. Includes all lower features plus additional coaching, training, leadership and team development courses. Some of the advanced training includes helping advisors and portfolio managers to develop their own emotional intelligence and better understand what biases they bring to the table. This helps firms improve their interaction with with different clients, improves client overall satisfaction and reduces complaints. Their clients include a wide range of firm sizes from small registered investment advisors to broker-dealers, banks and insurance companies, Massie explained. Personality Assessment as a Marketing Engine? Financial DNA offers to improve client communications and create a value-added differentiator that will help with client conversion and retention. Current users offer anecdotal evidence of prospects that became clients because the advisor applied insights from the assessment to structure the conversation in a way that made the client feel deeply understood. The marketing application itself isn’t new: Riskalyze has long positioned its offering as a tool to help advisors improve prospect-to-client conversion. As more advisors begin to use Financial DNA and more data becomes available, we would be curious to see their extended results. Every risk assessment tool has its limitations. At the end of the day, a risk score or personality profile is only the start of a bigger conversation. The best approach combines an assessment of the client’s willingness to take risks with his or her financial goals and capacity for taking risks. Financial DNA promises to help advisors tailor communication styles to match client preferences and guide triage efforts when the market hits a bump. In giving advisors a tool that goes beyond risk assessment to improve their ability to reach and coach clients, this platform’s innovating approach may be onto something.